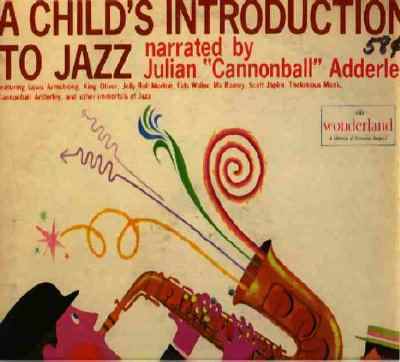 "A child's Introduction to JAZZ"
This is one of a series of 12-inch long-play records designed to take children into a delightful and exciting world of entertainment. They can learn wonderful things from these albums, but it never has to seem like learning. That's part of the magic - for on these recorded tours into our "Wonderland" your chidren's guides are celebrated performers, including some of the most famous and most sparkling names in the entertainment world: actors, singers and musicians whose skill and charm are well known to both children and grownups. These albums are conceived, planned and produced by an experienced, expert staff, and are recorded and processed at the finest of modern high-fidelity sound studios. "Wonderland" records are pressed on topquality, unbreakable vinyl. All are attractively packaged in sealed, factory-fresh albums, with delightful and colorful cover illustrations by outstanding artists. The story of jazz is the story of an exciting and truly American art form - a music bursting with the vitality of American life. Characterized by a regular beat and a direct emotional appeal, jazz can-if properly presented-have deep fascination and rich meaning for young children from the time they first begin to show an interest in music. To insure such proper presentation, we have enlisted the aid of one of today's most famous jazz musicians - Julian "Cannonball" Adderley, who is also noted as a highly articulate and well-informed writer in this field. His commentary is neither an over-formal history nor a technical 'music lesson.' Instead, it is an easy-going, conversational discussion of the highlights of the jazz story in terms of the major styles and great performers from New Orleans Up to the present-illustrated at every step of the way by excerpts from the celebrated Riverside catalogue. Included are such notable jazz names as Louis Armstrong, Bix Beiderbecke, Fats Waller, Jelly Roll Morton, Duke Ellington, Coleman Hawkins, Sidney Bechet, Thelonious Monk, and Cannonball himself. There have been previous attempts to present jazz to young listeners-but never before has there been such a comprehensive and authoritative introduction to this important American music as that contained in this uniquely valuable album.